Sunday, Nov 6, 2016 From 6 P.M. to 10 P.M.
Sunday, Oct 18, 2015 From 6 P.M. - 10 P.M.
SATURDAY, SEPTEMBER 20th • 6:30pm until...? Relaxed parking will be enforced in the streets surrounding the park during the event. Celebrating the life and memory of a great human rights icon with the Salvadoran people, and the first Salvadoran memorial plaza in the U.S.
Wednesday, November 20, 2013 / 11:00 a.m. - 12:00 noon. In celebration of its 40th Anniversary, the LA Mumbai Sister City Affiliation invtes you and a guest to a "Peace Tree Dedication Ceremony". Maestro Zubin Mehta will plant an "Albizia Julibrissin" (Silk Tree). SISTER CITIES OF LOS ANGELES INC.
Sunday, November 4th @ 6P.M. Send in your check by October 25, 2012 to the contact below. Sunday, May 20, 2012 @ 12 p.m. -5 p.m. Celebrating Los Angeles' People to People Relationships Around the World. Sunday, October 23, 2011 @ 6 p.m.
4 hours of dance and music from around the world. Celebrating Los Angeles' people to people relationships with 25 international cities. Sister Cities International introduces a new member-benefit! Members will now have the opportunity to participate in a free monthly Webinar Series beginning on Wednesday, May 18 at 2 p.m. EDT. The first webinar will cover helpful tips on grant writing for your sister city programs. Webinars will feature video and audio content as well as a question and answer section. to Register Please e-mail communications@sister-cities.org with the date and topic of the webinar you would like to participate in. There are only 50 spots available for each webinar, so reserve yours today! Once you are registered, you will receive a confirmation e-mail containing call-in information and a link for the video content. Please note, dates are subject to change as speakers are confirmed. Opening reception May 12, 3-5:00 p.m. Closing reception June 4, 2-4:00 p.m. Location Charles White Elementary Gallery, formerly the Otis College of Art Gallery 2401 Wilshire Blvd. Over two Hundred students from the Los Angeles Unified School District and schools in St. Petersburg, Russia, will concurrently display their artwork in an exhibit featuring their Sister City links. The event, jointly sponsored by the LAUSD Arts Education Branch and the Los Angeles-St Petersburg Sister City Committee, is designed to foster cooperation and cultural exchange through the arts between the two cities and stimulate mutual understanding of their students. After the exhibition closes in Los Angeles, the student artwork will travel to St. Petersburg where it will be displayed as part of the white nights’ Master Class International Arts Festival. It will then be donated to the local orphanage “Transit”. As an expression of hospitality, our gracious hosts will treat members to a traditional Chinese tea ceremony. NOTE: Due to limited capacity and an extraordinary venue, location and directions will be provided only to those who reserve by May 6. • consider new services to member cities and organizations. Additional Info. For directions, please respond promptly to President Stelle Feuers: Stellefeuers@aol.com or 714 536-0666. TICKETS AVAILABLE NOW! First come, first served. Click here to purchase tickets. The historic Gilmore Adobe is the enchanting setting for the Annual Sister Cities of Los Angeles Fundraising Party. Built in 1852, the Gilmore Adobe is s one of the oldest standing properties in Los Angeles nestled against the backdrop of the Farmers Market and The Grove. The Fundraising Party is your opportunity to experience the Gilmore Adobe and the entertainment, culture, and excitement of the Sister Cities as you dine, dance, and mingle with their many international representatives. 11:00 a.m. to 12 Noon - Special guided tour of LACMA's Lucknow Special Exhibit. Lunch - 12:30 p.m. Tanzore Indian Restaurant. Please meet our group promptly at 10:45am at the Museum's BP Grand Entrance. New Tools For Improving Effectiveness"
Sunday, October 2 and 3, 2010 11:00 a.m. - 10:00 p.m.
Sunday, October 24, 2010 from 6:00 p.m.
Saturday, July 31, 2010 from 10:00 a.m. to 10:00 p.m.
Thursday, June 24, 2010 at 6:00 p.m.
Attendees All, Tickets on sale starting April 2, 2010 at www.arclightcinemas.com or at the ArcLight Hollywood box office. Saturday, May 1st at 10:00 a.m.
3870 Lemon St. Riverside, 92507. Thanks to those of you who braved the storms and participated in SOCAL's annual conference at the Huntington. Despite the weather, we had the highest attendance ever and a most successful program. The Southern California Sister Cities' (SOCAL) annual membership meeting is scheduled for Saturday, May 1st at 10:00 a.m. at the Riverside Community Arts Association: 3870 Lemon St. Riverside, 92507. Everyone affiliated with a sister city is encouraged to attend. There wll be a round table discussion of The Future Of Sister Cities. In addition, Mark Schooley, the director of the Riverside Community Arts Association will brief us on his efforts to hold art exchanges with Riverside's three sister cities in Japan, Mexico and China. Lunch will be served. Please R.S.V.P to Stelle Feuers at stellefeuers@aol.com or 714 536 0666. Join us on May 1st. Your input is valued. About the Event Welcome to the 2010 Sister Cities International Annual Conference. As I think of this year's theme, Community Diplomacy: Empowering Partnerships and Programs, I think of all the remarkable work done by average people every day to bridge the gap of cultural understanding worldwide. People like sister cities members in small towns and big cities who have opened their homes, wallets and minds to creating long-lasting peace through partnerships. This year's Annual Conference aims to engage Sister Cities International stakeholders like never before through diverse educational sessions, networking opportunities and enriching cultural experiences, all brought to us by the gracious people of Albuquerque. I invite all attendees to answer the call to action: Come help us shape what it means to be a citizen diplomat. Come be part of the dialogue. Come help Sister Cities International create empowering partnerships and programs. Corner of Third St & Fairfax Ave.
Four hours of international music, dance, performance art, and culture from the 25 international Sister Cites of Los Angeles. Presented free in the outdoor park at the world-famous The Grove at Farmers Market, Cultural Day will feature over 100 performers in elaborate native costumes. Last year's performances ranged from ten minutes to forty-five minutes and included dance groups from Indonesia, Taiwan, Lebanon, and Mumbai; Berlin’s recreation of 1930s German cabarets; and Mexico City’s 45-piece orchestra of children age 6 to 19, Banda Juvenil Santiago Comaltepec. Ken O’Malley, the Irish singer and leader of the Twilight Lords, was the event’s emcee. Open seating on the lawn in The Grove's outdoor park. Limited chair seating available for the elderly and others first come, first served. Saturday, Februrary 27, 2010 @ 8:00a.m. 9:15 a.m. Adlai Wertman, Founding Director, Society & Business Laboratory, Marshall School of Business, U.S.C. Friday, September 25, 2009 / 6:30p.m. Sunday, October 11, 2009 / 6:30p.m. Saturday, August 22, 2009 / 5:00 p.m. to 10:30p.m. Monday, June 22, 2009 @ 6:00 p.m. Please Enter on Vermont Avenue and follow up to Griffith Observatory parking lot. Staff will be on hand to direct you. We’ll hike up the Charlie Turner Trail, a gentle 1.5-mile climb to the summit where we’ll view the City of Angels, share a meal until sunset and enjoy the twilight descent. Special transportation will be provided for those who may need assistance. Date/Time SUNDAY JUNE 28, 2009, 2:00 p.m. to 5:00 p.m. The International Symposium is open to applications from individuals with an active interest in international relations. What other program does the Institute for Cultural Diplomacy offer? Informational Workshop Monday, June 8, 2009 from 5:30 p.m. to 6:30 p.m.
Joe Smoke, DCA’s Cultural Grant Program Director at: joe.smoke@lacity.org. Los Angeles - The City of Los Angeles Department of Cultural Affairs (DCA) launched the second round of its Cultural Exchange International (CEI) Pilot Program and released the second set of guidelines for new applicants. CEI is a two-year fellowship program intended to enhance Los Angeles as a national and international center for the arts and foster cultural understandings through the expansion of networks and the exchange of knowledge between creative professionals. (two weeks to three months), or creative professionals coming to Los Angeles for intensive residencies (also two weeks to three months), who have planned collaborative relationships with Los Angeles organizations to host their residencies. The program has been designed to support individual professionals or small groups (with a limit of three to four people per group). In the first round of fellowship awards, 7 creative professionals, often leading teams of artists; 1 Los Angeles for-profit company; and 4 Los Angeles non-profit organizations were recommended for support with $88,000 for fellowship projects in Bolivia, Brazil, Cuba, Indonesia, Kazakhstan, Mexico, Poland, and Rwanda. All of these projects will also culminate in free public presentations in Los Angeles. An additional $12,950 is being awarded to three of these projects, which take place in Latin America, by the National Performance Network (NPN) for a total of $100,950 in funding support. Los Angeles artists traveling abroad. Funding from the National Performance Network focuses on exchanges between Los Angeles and Latin America and the Caribbean. To date, several respected sponsor-partners have enlarged the pool of funds committed over the two-year pilot project to more than $550,000. For CEI’s second round of fellowships, partnerships have been extended to include the Foundation for International Cultural Activities (SICA) in the Netherlands, the Sacatar Foundation in Brazil, and the Trust for Mutual Understanding, which supports exchange between the United States and Russia, as well as Central and Eastern Europe. The Department of Cultural Affairs (DCA) both generates and supports high quality arts and cultural experiences for Los Angeles residents and visitors. DCA advances the social and economic impact of the arts and assures access to arts and cultural experiences through grant making, marketing, public and community arts programming, arts education, and creating partnerships with artists and arts and cultural organizations in every community in the City of Los Angeles. DCA grants $3.2 million annually to over 280 artists and nonprofit arts organizations and awards the Artist-in-Residence (A.I.R.) and City of Los Angeles (C.O.L.A.) Individual Artist Fellowships. The Department provides arts and cultural programming in its numerous Neighborhood Arts and Cultural Centers, theaters, and historic sites, and manages several arts and education programs for young people. It directs public art projects and manages the City’s Arts Development Fee and Percent for Arts Programs, and the Art Collection and Murals Programs. DCA markets the City’s cultural events through development and collaboration with strategic partners, design and production of creative promotional materials, and management of the culturela.org website. The 7th annual Indian Film Festival of Los Angeles (IFFLA) takes place on April 21-26 at the ArcLight Hollywood, the elegant, state-of-the-art facility at Sunset and Vine in Hollywood. Due to the success of SLUMDOG MILLIONAIRE, excitement and interest in India and its films are at an all time high. Come experience Indian filmmaking and music like you've never seen it before at the World Premiere of BOMBAY SUMMMER presented by IFFLA and Los Angeles Mumbai Sister City. Geeta, a young woman, tries to balance a thriving career and the needs of her family. Jaidev, an up-and-coming writer, struggles to establish independence from his wealthy family though he still relies on them financially. Madan, a commercial artist, is forced to supplement his sporadic income with risky illegal ventures to make ends meet. Through a strange twist of fate and circumstance, these three characters form a fast friendship in the booming metropolis of Mumbai. Their relationship promises to open eyes, hearts and doors on the road to self-discovery. Yet, the bonds of friendship are often fleeting when survival is priority number one. Director Joseph Mathew Varghese made the transition from the world of finance to documentary filmmaking and now comes his narrative feature film debut, BOMBAY SUMMER. The collection of young talent in this film promises a bright future for Indian independent film. Additional information on the film can be found here. Tickets can be purchased at the Arclight Hollywood box office or online at www.arclightcinemas.com. Make sure to check out the IFFLA website, www.indianfilmfestival.org, for a complete list and schedule of all the films playing at this year's festival. Saturday, March 28, 2009, 11:00 a.m. - 3:00 p.m.
Saturday, Feb. 7, 2009, 8:00 a.m. - 2:30p.m. Diwalicelebrates the coronation and return of King Rama to his kingdom of Ayodhya. After an epic battle, Rama ended his 14-year exile and reclaimed his princess Sita, who was abducted by Ravana, the demon King of Sri Lanka. During Diwali, homes are illuminated with terra cotta lamps and sweets are shared with family and friends. 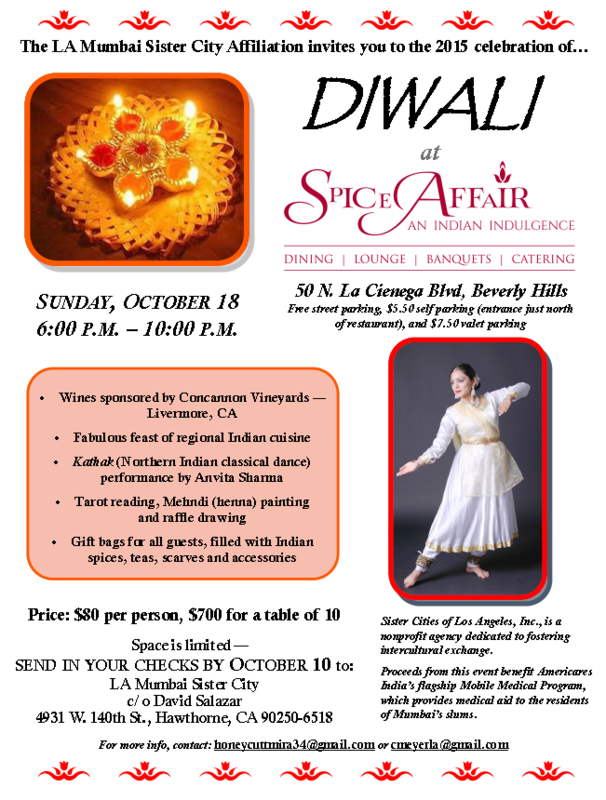 Proceeds from this event will benefit the AmeriCaresorganization in India. Organized by The LA Mumbai Sister City Affiliation is a non-profit agency (501.C3 No. 0644627) dedicated to the promotion of intercultural understanding to cultivate world peace. In commemorating our 63rd anniversary of independence, the Consulate General of the Republic of Indonesia in Los Angeles and the Indonesian Community in Los Angeles would like to invite Los Angelinos and the general public to join us in a festival of the Indonesian tradition and heritage. This public event, called “Celebration of Diversity: Indonesian Day 2008”, is scheduled to be held on Saturday, August 30th, 2008 from 10.00 a.m. – 20.00 p.m. The venue is at the vicinity of the Consulate at 3457 Wilshire Blvd, Los Angeles, CA 90010.
from 10.00 a.m. – 20.00 p.m. In 1948/49, America and its Allies saved over 2 million people from a Soviet blockade through the Berlin Airlift. One of the greatest humanitarian efforts ever undertaken, the Airlift also laid the foundations for a friendship between Germany and America that endures today. Co-Curated by Peter Nagy, Director of Gallery Nature Morte, New Delhi and Patricia Hamilton, former owner of Hamilton Gallery, New York and currently a private dealer in L.A.
KICK-OFF FUNDRAISER IN "A GARDEN SETTING"
Networking event featuring entertainment and hors d¹oeuvres tasters from around the world in a superb garden setting. Price Donation: $25 per person. In partnership with the Los Angeles Area Chamber of Commerce, this conference focuses on green technologies in our sister cities and is designed to encourage trade by helping small to medium sized businesses take advantage of existing Sister City relationships throughout the world. Join Councilmember Tom LaBonge in the annual Summer Solstice Hike to Mount Hollywood at the Charlie Turner Trailhead. A special ceremony at the Grand Avenue Festival to welcome hundreds of new students from Los Angeles¹ Sister Cities from six continents. December 5, 2007 @ 10:00 a.m.
We are proud to be the hosts of the 17th U.S. Africa Sister Cities Conference. We are planning a very comprehensive conference full of information, pertinent issues, excellent speakers, entertainment and opportunities to share ideas. We would like every U.S. city with an African sister city to be represented. One goal is to strengthen our partnerships and reflect on each other’s successes. Another is to get clarity on U.S. policy on Africa. In addition, we want to work together to help revitalize those relationships that have not been as active, as you would like. Africa is a very important part of the world stage. The African investment environment has improved substantially in recent years and foreign investment in the continent has grown. Our citizen diplomacy, as sister cities, is critical during this era of great development potential. Please come to Lansing in July so we can focus on our theme together: U.S. Africa Relations: Building Alliances. Registration materials will be sent to you soon. Put the dates on your calendar and start planning now to attend. If you have stories to share, please let us know. Feel free to contact us at masonb@msu.edu. A special ceremony at the Grand Avenue Festival to welcome hundreds of new students from Los Angeles' Sister Cities from six continents. President of Sister Cities of Los Angeles, Inc.
to develop business in those countries. In partnership with the Los Angeles Area Chamber of Commerce. share their experience in creating and expanding their businesses. A spotlight of IFFLA 2007 is the Tribute to India’s acclaimed actress, Deepti Naval. It is a great honor and unique opportunity for our Festival to host Ms. Naval and highlight her remarkable career and talent not only as an actress but as a poet and painter as well. The Festival will showcase a selection of three of her films and will also host an intimate one-hour discussion with Deepti Naval moderated by Hollywood Reporter’s film critic Kirk Honeycutt. For more information about Deepti Naval and her work, we urge you to visit her beautiful and informative website: www.deeptinaval.com. Moderated discussion between Tribute Honoree Deepti Naval and Hollywood Reporter's Kirk Honeycutt, followed by the screening of the film KAMLA. A tribal slave girl who is brought to the city by a manipulative news reporter looking to prove the existence of the flesh trade in modern India, creates ripples in the capital through her story, upsetting the reporter's life. Tickets are $15 each and can be purchased at the ArcLight Hollywood box office located at 6360 Sunset Blvd or online at www.arclightcinemas.com. The festival will also showcase two more of Deepti Naval’s films, PANCHVATI and MIRCH MASALA. In a case that redefined the seriousness of spousal battery in British courts, a Punjabi woman fights for her freedom after being imprisoned for the murder of her abusive husband. Based on a true story, PROVOKED is directed by Los Angeles based filmmaker Jag Mundhra. This intense film brings together a vibrant pool of talent that includes actors Aishwarya Rai, Naveen Andrews, Nandita Das and Miranda Richardson and a touching score by A.R. Rahman. Tickets are $60 each (film screening and reception) and can be purchased starting March 22 at the ArcLight Hollywood box office located at 6360 Sunset Blvd or online at www.arclightcinemas.com. "21st Century Perspectives on China"
Registration and Coffee: 8:30-9:00 a.m. Guest Speakers: 9:00 a.m.-12:30 p.m.
"Maritime China: Pasts, Presents, and Futures"
"Banking on China: Facets of a Big Future"
Whittier College: "The Marketing of Chinese Cinema: Self- Representation and the Western Gaze"
Tabletop exhibits by California sister cities, highlighting their exchange activities with China. Chinese Garden Presentation: 2:30-3:00 p.m. The development of the Chinese Garden at the Huntington. Tour of the Chinese Garden: 3:00-3:45 p.m. Parking in the Farmers Market lot will be validated. Community Room is located on the 2nd floor.